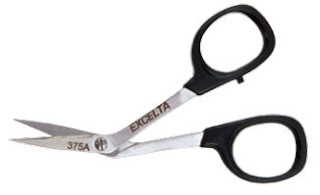 We have recently taken the time to separate different types of Excelta Scissors on janelonline.com to make your selection process quick and easier. Janel offers a variety of Excelta Scissors including: High Precision Scissors, Large Scissors, Standard Scissors, Kevlar Scissors, and Self-Opening Scissors. Stainless steel with I” Curved blade, 7⁄8” and 1 1⁄4” Curved blades . Ideal for ultra miniature work and in confined areas, close tolerance cutting, delicate applications, and where small strong blades are required. Made in Switzerland. Excelta's extreme precision Lexer Scissors feature Stainless Steel construction with Tungsten Carbide inserts. These amazing scissors are available in both straight and curved blades and are produced with gold plated handles for easy identification. These Scissors come is both curved and straight blades, small and fine blades , and all of these scissors are made in Japan. These have the choice of many different features including:self opening, ergonomic, extra-long lengths, serrated, molded handles, kevlar cutting, chrome plated, and blade angles.